Amanda was the first event coordinator I spoke with and I remember at the end of our first phone conversation saying to her "I mean... I don't really need to think about this at all, I feel like we're really going to get along really well and I like you already so can I just say okay now and we'll get the contract going?". Trust your gut, she is incredible. I will be saying thank you to Amanda for years to come. Not only is she an amazing person, fun to be around and genuinely positive, she knows what she is doing when it comes to wedding planning. I asked for her advice and opinion often and trusted her with everything. She has this amazing app she developed that kept me so organized I was impressed by myself and need it for my life. You hear horror stories about seating charts, I had a blast using her app to create our seating chart. She was on top of EVERYTHING. The timeline she creates for your wedding day is so impressive there is no room for anything to go wrong and nothing did, the day was absolutely perfect. She was there for the rehearsal and many of our wedding party took the time to say "Wow, she's got this covered", yep... listen to Amanda and all will be fine. Same with the wedding day, many people mentioned how amazing she was for various reasons, her hard work did not go unnoticed by us or our family and friends. Amanda was SO attentive day of, making sure we had anything and everything we needed and even bustling my dress many times! I felt so confident passing off all of our decor and trusted her to make many day of decisions on how things looked, she knew what I was going for and she nailed it. Having a team like Amanda's that you trust to ensure your day is perfect takes so much of the stress away, I was truly able to enjoy every second of our wedding day and weekend. I felt confident in the team we had and they proved me right. The entire process would not have been as much fun for me without Amanda as part of it. 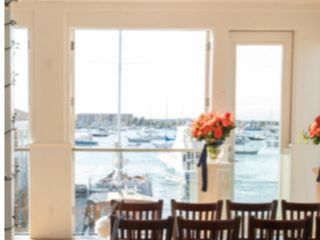 I highly suggest you book Hidden Host Events for your wedding! We worked with Hidden Host for day of coordination, and they were fantastic! She helped me stay organized throughout the planning process, and then it was such a relief to hand it all over to her leading up to the wedding day. She provided us and all of our vendors with a detailed itinerary and made sure everything went smoothly for the rehearsal and wedding day. I made some of the decor myself and borrowed some items from Hidden Host, and they brought it all together in such a beautiful way- it was so nice to not have to worry about setting things up on the morning of the wedding. Without Amanda’s organization and ability to run the show from behind the scenes, we would have not been able to enjoy our wedding. We are forever grateful for Hidden Host Events- they truly went above and beyond to make our day special! Hello! 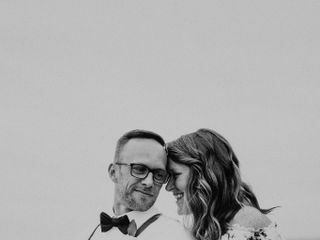 I have been wanting to get to this review for a couple of months now, my wedding was on 10/6/18 and our day turned out to be perfect-and I attribute that to Hidden Host Events and Amanda Barker. From the very beginning, Amanda helped us to get organized, find the best vendors, and keep on track with all of our ‘To-Do’s’. She went well above and beyond just helping me with the ‘day of’ coordination. She helped us to remember all of the smaller details that would probably have been forgotten along the way. She has incredible connections with other vendors, venues, etc and is an absolute professional at what she does. She even made sure to get a birthday cake for a friend from out of town for my rehearsal dinner! She is committed to making sure that your wedding day is everything you want and more. We truly could not have asked for a more perfect day! In addition to Amanda being incredibly talented at what she does, she is also a wonderful person! If you want your wedding day to be a dream, then I would highly recommend gettting in touch with Hidden Host Events and Amanda, we are so grateful we did! Thank you so much Amanda! Amanda and her team did an AMAZING job for our wedding this past September. She truly understood what we wanted, needed and made the whole process as smooth as possible. She also anticipated our every need the day of. We felt like royalty. Thank you Amanda! What a day! The worst rain event of the summer with potentially catastrophic thunder and lightning deluged my daughter's outdoor tented wedding! So severe was the rain, it washed out the wedding site. With Amanda's calm directions, we postponed the wedding for 15 mins. and relocated the ceremony to inside the tent. Without her calm demeanor and her guidance, it would have been my worst nightmare! She reassured me and calmed me down and buoyed me up! Amanda and her workers were soaked from running back and forth from the house to the tent - checking with the musicians, caterers, and guests. She made sure everyone was in place and ready to go. She orchestrated the entire ceremony - and it was perfect! She worked so hard, we truly couldn't have done it without her! If you are going to hire a wedding planner - Amanda will be wonderful! We can't say enough good things about her! Amanda was a delight to work with. She brought my vision to life and did everything in her power to make sure everything was done correctly. I can honestly say I trusted her every step of the way and did not have to stress myself the day of my wedding!! Amanda surpassed all of our expectations of what a day of coordinator should be. She was the only day of coordinator that didn't have a limitation of how frequently we could speak to her before the month of the wedding. The day of our wedding the weather changed very last minute and we were going to need a rain contingency. She called a friend and asked him to build a trellis we could use inside of the venue as there were not viable options so last minute. She also had her assistant go to a local restaurant to get snacks for the wedding party before the ceremony as we were all hungry after taking pictures for hours, and she did a great job managing all of the vendors as well as all of the family in a smooth and calm manner. We always felt like she was on our side and in our corner when we had questions or needed help and we could not recommend her enough. Amanda and the Hidden Host team were absolutely amazing. She was calm, cool, and collected on the day of our wedding, which made me and my husband feel calm as well. She kept us on schedule seemlessly and just made the day run perfectly. 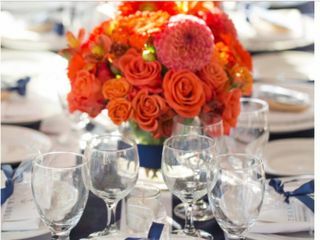 I highly recommend Hidden a host Events to anyone wanting to have a great wedding day without having to worry about every detail- since Amanda handles those details for you! Couldn’t have gotten married without her!!!! Without Hidden Hosts my wedding truly would not have happened. Amanda made sure I was on schedule as well as all of the vendors. She had a solution for every problem that arose on my wedding day and it allowed me to be care free and enjoy the day with my husband. She is Worth every cent-she was the most important vendor we hired that day. She is a brides fairy godmother and I am so thankful to her and her team!!! You cannot make a mistake by going to Amanda for your wedding. Everything about working with her, from her team to her contacts and overall industry knowledge, far exceeded our expectations. Amanda truly cares about her couples and it is easy to see she loves her work. Even if you are unsure that you need or want a planner, trust me and go to Amanda! My only regret is that we did not hire her sooner! We originally tried to do everything ourselves but once we hit a snag with transportation we turned to Amanda and her team. We handed over terribly unorganized notes, and she somehow turned it into a fantastic plan that operated smoothly, and was cost effective! Amanda’s organizational system through Google Docs is fantastic, allowing you to plan from anywhere, which was good for us as I was living 10 hours from the wedding site and home, and 8 from my fiancé for all of the planning process. Amanda even came to other vendor meetings and made sure everyone was on the same page. Never mind being phenomenal with my very anxious and overwhelmed mother! Our wedding day went perfectly. Amanda and her assistants managed to make everything just happen, and I didn't have to think or worry about anything. They were happy, lively people, adding to the tone of the day. They even stayed all night and stopped by after with items we had left at the reception venue. I am actually a little sad now that the wedding is over, because I won’t be working with her anymore. 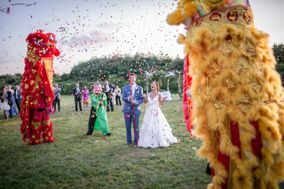 If you don’t feel like reading an entire essay about if and why you should (definitely) hire Hidden Host Events for your wedding, we will just get to the point: YES, we recommend them and yes, you should do it! You will not regret it. Amanda Barker far exceeded our expectations for coordinating our special day. Weddings are expensive, but Amanda proved to be the best value in our budget. We would recommend Amanda for any wedding of size or venue. She truly loves her job and it shows. Her staff, Aaron and Morgan, were extremely professional, reliable, and just as significant in helping with the entire process. We could not imagine our wedding having been the dream that it was without the Hidden Host family. 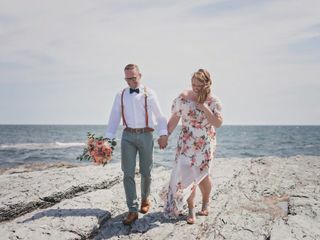 Having been together for 8 years, my fiancé and I had plenty of time to fantasize about our wedding day, and thus came to Amanda excited with our abundance of ideas and wishes (in addition to the crucial need for her coordinating services). With limited time (3 weeks! ), we were aware that our vision for the day would most likely be unattainable; however, Amanda proved us wrong. Because of her ability to envision our ideas and her natural aptitude for coordinating, our wedding was even better than what we had dreamt of. She loves love, she loves weddings, and she loves her job. She will treat you, your fiancé, and your wedding as if it is important as her own. Amanda is the best. She's incredibly responsive, flexible, hard working and a pleasure to work with. She hired her as a day-of coordinator but she was much more than that. We met prior to the wedding and she helped plan everything during the weeks leading up to the wedding. She let us borrow string lights and 50 lanterns-- saved us a bunch of money on rentals!!! She and her team pulled off the most amazing DIY backyard wedding for 250+ people, all in the rain! It was amazing. Couldn't be happier with another wedding coordinator. Amanda comes HIGHLY RECOMMENDED. I wish I could give Hidden Host Events more stars! Amanda is the absolute best! I can not even begin to explain how amazing she was and how incredible our wedding turned out to be. Everyone who was there has just kept saying that it was the absolute best wedding they have ever been to! Amanda was able to perfectly understand what my wife and I wanted even though we weren't entirely sure ourselves! She found the perfect vendors for everything. She was there every step of the way and made sure everything was incredible. I don't know what we would have done with out her. If you are planning a wedding, then Amanda is the only person for the job. I really can't say enough and can't thank Amanda enough for all her work and for the most wonderful wedding! Amanda was amazing throughout the entire planning period and made things go perfectly the day of! I can't say enough great things! Our wedding would not have been what it was without Hidden Host Events!! The day was absolutely perfect! Amanda went above and beyond for us, and I couldn't have done it without her! I highly recommend her. With her knowledge and experience you won't be disappointed! Thank you Amanda! Amanda was our month of wedding coordinator, and I am so glad we worked with her! I was initially hesitant about getting a coordinator, but it was one of the best decisions we made for the wedding. She provided some really useful tools to get organized, helped put together a very detailed and thorough timeline and helped make sure everything went smoothly. I am so glad we had her assistance! She did a great job the day of making sure everything was perfect at the venue, ran our rehearsal (without her I would have no idea what to do!) and was a pleasure to work with. She even has a professional steamer, and steamed my dress the day of the wedding! I would highly recommend Hidden Host Events LLC. We planned our wedding in 13 days! Where do we start? My husband and I couldn't have LOVED Amanda and her team more for the attention to detail and their thoroughness to make our day seamless! We got engaged on April 2, and I think Amanda was the second or third person we called [who wasn't family]. After her genuine excitement for us, she asked "Ok! Great! This is awesome, so what are we thinking... this year... next year?" After a short giggle under my breath, I replied "Well we were thinking April 15th..." Her response was PRICELESS... "Wait. OF THIS YEAR? OK! We have 13 days to do this!" She truly whipped into action and helped me figure things out in what seemed like minutes. 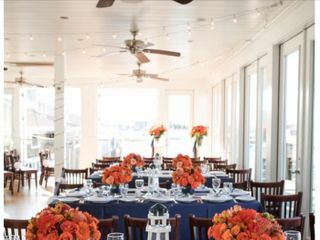 Without Hidden Host Events, there is no way we could have had the wedding of our dreams. She is so passionate about what she does. I had everything ounce of Faith in her right from the start. It went by without a hitch, and I had ZERO stress worrying about how the HOMEMADE wedding cake was going to get to the venue, or how the place was going to be decorated, or how my guests were going to find the exact spot out in the middle of the ocean that WE wanted to promise FOREVER to one another. She is a GEM! Truly and honestly love her to pieces and so so Happy we found her. THANK YOU for making out wedding day EVERYTHING it was! Booking Amanda was a great move. She really made sure everyone was on the same page. Vendors, guests, wedding party. I highly recommend hiring her! Amanda was absolutely amazing and worth every penny! A MUST HAVE if you want a smooth wedding day. She went above and beyond our expectations multiple times throughout our day! We will definitely keep her contact for any future events. Amanda is an absolute pleasure to work with. She went above and beyond in making sure every detail was handled and even though we only used her "day of coordinator services" it felt like she was our total wedding planner. I can't thank her enough- she made sure the only thing I had to worry about on my wedding day was having the time of my life- which I totally did! Amanda was a pleasure to work with! She was always available by e-mail and helped me with any question I had. She was willing to help with anything I needed! She is highly recommended! Best investment for our wedding BY FAR! Amanda exceeded every single expectation. We hired Amanda about 6 months before our wedding and she proved incredible helpful. Not only was she super organized with all of our vendor contracts, she also was easy to reach when I had random questions. Where can I get shrubs to go in front of our port-a-potties? Amanda had a guy. Where can we get lunch delivered for the girls getting ready day of? Amanda had two awesome recommendations. Then came the day of - Amanda turned it on and made the whole day go by so seamlessly. Her helpers were also amazing, attentive and kind. I can't even imagine trying to focus on the logistics day of. I was so at ease knowing Amanda had everything covered! Hire Amanda - it will be your best decision yet!! Amanda at Hidden Host Events was such a lifesaver and stress reliever! I hired her for her day-of-coordinator services but she was SO much more than that! She assisted me with anything and everything I threw at her, and I couldn't have been happier with the results. From vendor recommendations and negotiations, to the rehearsal, checking on me through out my big day, I couldn't have asked for a more professional, dedicated, passionate person to assist on my wedding day! The Hidden Host team was simply marvelous. I used their Day-Of Coordinator service, as I wanted to do all the pre-planning myself. I instantly connected with Amanda during our first phone call. She remained in touch throughout the planning months, attending our final walkthrough and rehearsal. She was always on time, professional, and really took the time to understand my vision. When I walked into my venue and saw that she had made my dream wedding fully come to life, I could have cried. Look no further - hire Hidden Host Events!